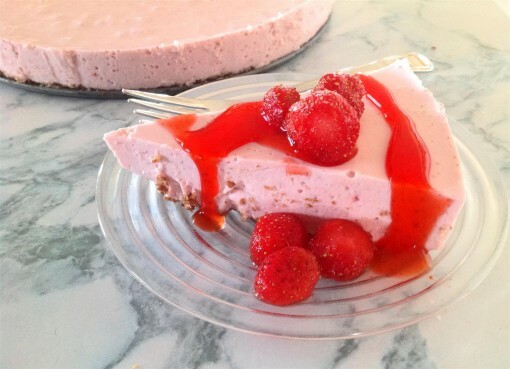 No Bake Strawberry Cheesecake was posted on April 11th, 2013 and is filed under Desserts, Gluten Free, Kid Friendly, Low Carb, Protein, Recipes. This entry has 22 comments. You can follow any responses through the RSS 2.0 Comment Feed. We’re always making new versions of the classic No Bake Cheesecake. It’s one of our family’s favourite recipes, not just because it tastes amazing, but because it’s a fairly low calorie, high protein, low sugar, gluten free, and oh-so creamy. The other cool thing about this recipe is that there is actually no cream cheese in it. Lots of good things going for this one! 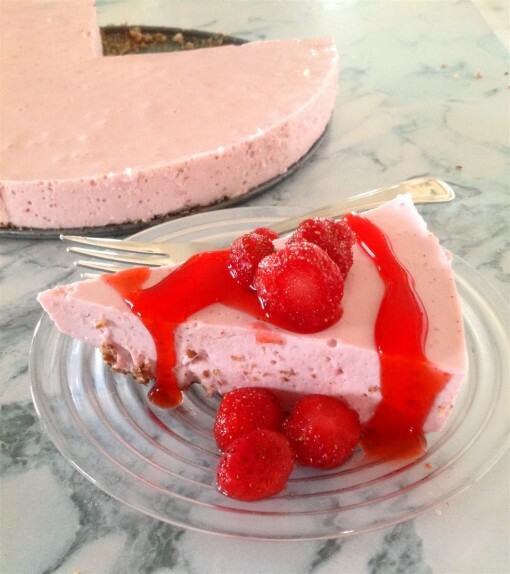 So here’s the latest and greatest…the No Bake Strawberry Cheesecake. Oh yah. This version is lower carb than the other versions. The base of the crust is made with nuts instead of the original graham crust. You can make a sweeter version with the addition of a few dates ground in as well. This dessert is quite low on the glycemic index, so that’s why I skipped out on the dates. This serves 12. Melt the coconut oil and mix in the flax seed, ground walnuts (or almonds), and the Truvia. Press mixture into the bottom of an 8 or 10” spring form pan. Set aside. For the filling, mix the gelatin with the tagatose, stevia, and salt. Add the egg and almond milk. Put the filling on medium heat until gelatin is dissolved and the mixture thickens a bit. Now put the cottage cheese in the blender and slowly add the above mixture. Mix until blended well. Add the strawberries until blended. Fold in whipped cream and put in pan over the crust. To serve, top with fresh strawberries and some strawberry sauce. Enjoy! Want to try the other healthy cheesecakes? What no bake cheesecake flavour should we make next? I remember making no-bake cheesecakes when I was younger. Peanut butter is always a good one. Such a pretty, spring-y dessert! 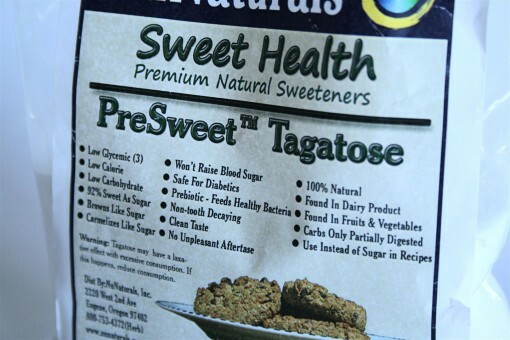 I have been loving experimenting with tagatose too. It’s a great sub! No bake? Made with cottage cheese. YUM! Looks delicious. It looks beautiful and fresh, perfect for summer! Really looks lovely. I think my husband would love this.. we really like strawberries at our house. Looks delicious! I can’t wait for strawberry season to arrive so I can use fresh berries! Angela – fresh is always better, but for this recipe we used thawed, frozen berries. this is JUST OUR SPEED TOO!! cake batter or birthday cake flavor!!!! Mmmm, Linz…that sounds like fun! Haha, Kierston…I look forward to it! Mmm, I love your healthy cheesecake recipes. Cheesecake is always my husband’s request for his birthday… gotta try this one! Wow! this looks so yummy and as I’m a strawberry lover I’m sure going to try this one out. Strawberries are the best this time of the year. That looks yum!